Artists: Karin Andersen, Elena Arzuffi, Alessandra Baldoni, Alessandro Bavari, Luca Bidoli, Brothers Calgaro, Vanni Cuoghi, Berenice Darrer, Luca Del Sordo, Angelo Di Dedda, Ulrich Egger, Fiorella Fontana, Nicholas Genovese, Cristian Ghisellini, Daniele Giunta , GRAL (Pretty Bertagnin & Albano Frediani), Gianluca Groppi, Franco Losvizzero, Nico Macina, Gianni Moretti, Serena Piccinini, Christian Rainer, Denis Riva, Stephen Card, Wilhelm Scheruebl, Siva Le Duc, Silvia Vendramel, Devis Venturelli. Curators: Antonio Arevalo / Maddalena Mauri, Daniele Capra / Nebojsa Despotovic, Martina Cavallarin / Svetlana Ostapovici, Silvia Conta / Michele Spanghero, Gianluca D’Inca Levis / Laura Santamaria, Carolina Lio / Marco Carli Rossi, Charles Hall / Giuseppe Gonella. 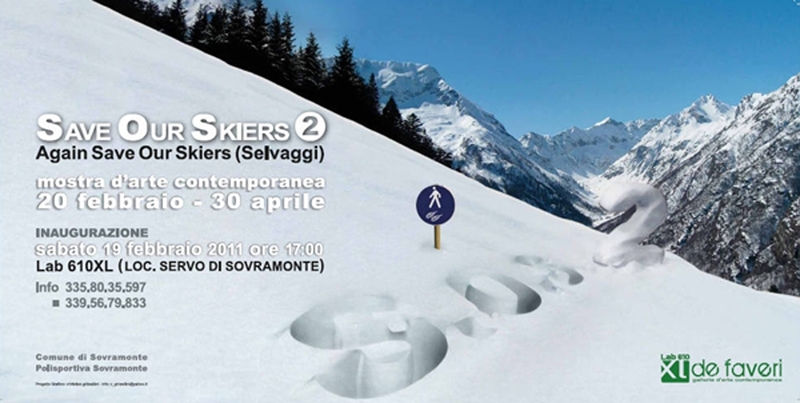 After the success of last year, the gallery of contemporary art faveri has decided to renew the appointment of the original exhibition impromptu entitled Save ours Skiers, it shows that last season had seen the free participation of a group of semi-spontaneous artists intervened in site personally bringing their own work and agreeing to participate in a walk with snowshoes, next inauguration. Not a performance, or a cultural gesture to assert some kind of truth, but a genuine attempt, spontaneous and ironic approach to distant worlds, which fascinate each other, once free from preconceptions and stereotypes. The exhibition, already last year, had left presage its essence irrepressible, full of fun and culture, revealing its objective, namely the recovery of that genius loci capable of restoring the reasons lost in the world who smiles; in this specific case, reaffirming the ancient freedom of art. The event returns this year, also in February, with the same formula of recreational and artistic event, but with the innovative aspects as regards the presence of artists and curators, a new formula developed and proposed by Viviana Siviero, critic and independent curator who has been working with the gallery de faveri and that he shares a certain pioneering spirit. An evolution that want to be a further step closer to the most ambitious project, created in collaboration with the City of Sovramonte, the CISA (Colonia Alpina for Artists Sovramonte), a sort of holiday stay with the chance to meet with other artists and / or critics, in a healthy environment, free from conventions and customs, hosted in the hostel or in private houses, with an area that can serve as studio widespread. The answer to this “call” on the part of artists and curators will be a useful signal to calibrate the further progress of the project and in any case a wonderful opportunity for everyone to exchange and fun. Artists, once again, will be engaged to carry and install personally the works, in the home, that this year ‘s changes: no longer the white walls of the gallery of Feltre, but the large space of Lab610 XL Servant of Sovramonte, underlining even more the experimental nature of the initiative, the theme of which will be free again, while the extent of the works Saà bound, so that the harmony of size the public can find endless food for thought different.